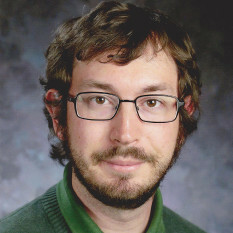 Hello everyone, my name is Simon Porter and I'm a postdoc at Southwest Research Institute working on the New Horizons mission to Pluto (and beyond). We held our 26th Science Team Meeting at the John Hopkins Applied Physics Lab (APL) in Laurel, Maryland on April 23-24, 2014. APL is the lead contractor for the mission and the meeting was held in the room where the science team will stationed during the encounter with Pluto. The first day of the meeting was focused on mission updates. The largest mission risk is still the search for a Kuiper Belt object (KBO) to visit on the extended mission. After flying past Pluto, New Horizons will pass through the Kuiper Belt, and has the ability to divert to nearby KBO to have second encounter. However, the KBOs that New Horizons could reach have, until this year, been in some of the densest star fields in the sky, so picking them out is really hard, and no one has yet found an object that New Horizons could reach. This year, however, there are much fewer background stars to deal with, so there is a real push to find a KBO target. The mission just put in a Hubble proposal to take the observations needed to find the target, and fingers-crossed, Hubble will find a second target for New Horizons this summer. Also, Marc Buie from Southwest Research Institute gave an update on the efforts to improve the orbit of Pluto using scans of historical photographic plates. Buie organized the scanning of plates taken at Lowell Observatory, initially by Carl Otto Lampland, between Pluto's discovery in 1930 (at Lowell) and 1990. That's 60 years of reliable data, covering nearly a quarter of Pluto's orbit. After the plates were scanned, the ephemeris group at JPL converted the points into an orbit that we can use to guide the spacecraft. With this recent orbit fit, the remaining uncertainty in how much New Horizons will have to correct its trajectory on final approach is less than 1 meter per second (which is really good). I had the pleasure of giving the first of several science talks on Thursday. I talked about some work I had done with fellow New Horizons postdoc Amanda Zangari and principal investigator Alan Stern on how the craters on Pluto might have been modified since they formed. It depends on the composition and structure of Pluto's surface. Pluto has a nitrogen atmosphere, which escapes to into space at rate of around a million tons per year. That is a lot of nitrogen to lose, so in order for Pluto to still have an atmosphere, it has to either have a deep coating of nitrogen ice on its surface, or be constantly venting nitrogen from volcanoes, like in the artist's concept below. I looked at what would happen in the first case, of deep nitrogen on the surface. I first calculated what this escape would do to the surface and found that one to a few kilometers deep of nitrogen ice would been needed to sustain the current atmosphere over the age of the solar system. Losing that amount of nitrogen would erase most of the smaller craters on Pluto. But, deep nitrogen also means that many craters will relax, as nitrogen ice at Pluto temperatures is almost as viscous as water ice in glaciers on Earth. If the big craters relax too, then they could also be eroded by the escaping atmosphere, and Pluto would have very few craters at all. However it is also possible that the nitrogen on Pluto is a thin outer layer supported by water ice (which is as hard as granite at Pluto temperatures), and so Pluto could then have plenty of craters. We will just have to wait until next year to find out. Ralph McNutt from APL then talked about his observations of Pluto with NASA's Chandra X-ray space telescope. Pluto itself shouldn't emit any detectable X-rays. However, when ions from solar wind slam into a neutral atmosphere, they exchange electrons with the molecules in the upper atmosphere. That charge-exchange process produces low-energy X-rays, which have been observed for the Martian upper atmosphere. And sure enough, McNutt did see precisely two (!) photons above the background that were the right energies to have been produced by charge-exchange in Pluto's upper atmosphere. Two photons is not much, but it is about the amount expected given the expected size of Pluto's atmosphere. McNutt is going to follow up with some much longer observations that might see tens of X-ray photons from Pluto. Alyssa Earle, a graduate student from MIT, presented some of her work on predicting the insolation on Pluto. Insolation (o not u) is the total amount of sunlight that reaches a planetary surface per unit area. On Earth, it's about 680 watts per square meter, averaged over a day. If Pluto's rotation axis were close to the axis of its orbit around the Sun (like Earth), the insolation on Pluto's equator would be about 0.4 watts per square meter, and less at the poles. However, Pluto's rotation axis is aligned to Charon's orbit instead, and so Pluto is tilted 115 degrees from the axis of its orbit around the Sun. Pluto therefore receives more sunlight on its poles than on its equator. On top of that, Earle showed that because of Pluto's eccentric orbit around Sun, the north pole receives more sunlight than the south pole. This is especially interesting because when New Horizons flies past next year, Pluto's north pole will be pointing almost directly at the Sun. We will therefore see Pluto at a very special time, when the north pole is receiving its maximum amount of sunlight. Next up was Will Grundy from Lowell Observatory talking about his several decade long program to monitor the the spectra of Pluto in the near-infrared. He started by pointing out that Pluto has gone through the most interesting part of its orbit since it was discovered in 1930; the half of its orbit that passes closest to the Sun. From these spectra, Pluto has nitrogen, methane, and carbon monoxide ice its surface, and all three peak at different longitudes on the surface. Nitrogen is the most abundant on the surface, but also the most difficult to detect because it is almost transparent in the near-infrared and its signal is swamped by the methane spectra. However, the nitrogen and methane ices are intimately mixed together, and the nitrogen causes the methane spectral features to shift relative to where you would expect them for pure methane ice, meaning that you can back out the amount of nitrogen mixed in with the methane. Since Grundy started taking spectra of Pluto in 1995, the strength of all the bands had been increasing, which makes sense given that Pluto has been moving to be almost pole-on as viewed from Earth. However, the spectra of Pluto that Grundy took last year with NASA's Infrared Telescope Facility (IRTF) in Hawaii was the first one that showed a definite decrease in the amount of nitrogen relative to methane. No one really expected this, and Grundy proposed several different ways that the relatively small methane grains could block the signal from the nitrogen. The real test will be to see if the nitrogen continues to buck the trend in the future, though the spectrometer on IRTF will be down for maintenance this year. Then, we had a short diversion from the outer solar system to the inner, as Francesca DeMeo from MIT presented her results on trying to determine the true compositional diversity of the asteroid belt. Initially, studies of asteroid spectral types showed there was a nice gradual gradient, with S-type asteroids in the inner main belt, and C-types in the outer belt. But then, as the number of known asteroids increased, more and more “rouges” with the wrong spectral type for their location were discovered. So, DeMeo and her collaborators and tried to remove all the biases in favor of asteroids that were closer and/or more reflective (either of which make the asteroid easier to see). What they found was that the asteroid belt is really well mixed, and that the outer belt and Trojan clouds (asteroids orbiting Jupiter's Lagrange points) have more asteroids than had previously been assumed. Also, there are D-type asteroids all over the main belt that are probably former Kuiper Belt objects that were thrown inwards during Neptune's great migration in the last stages of planet formation. It was really sobering lesson in just how mixed-up our solar system has become since it initially formed. Voyager 2 acquired the images for this high-resolution mosaic of Triton on August 25, 1989. The south pole is at the left; several of Triton's famous south polar geysers are visible. Toward the equator at right, Triton is covered with a strange "cantaloupe terrain". Next up was Paul Schenk from the Lunar and Planetary Institute talking about the geology of Triton, the largest satellite of Neptune and the closest analog to Pluto that we have ever visited with a spacecraft. 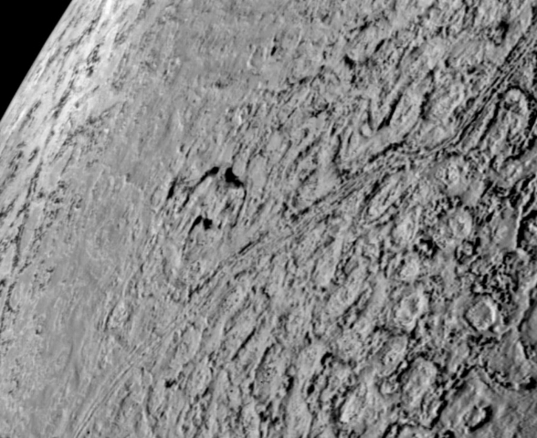 He started by reminding everyone that since the Voyager flybys, both Galileo and Cassini have re-educated us on the geology of icy worlds, and that New Horizons is likely to re-educate us on the geology of Triton. Schenk has made an excellent mosaic map from the Voyager 2 images of Triton, but he cautioned that the color information on the map is much lower resolution than the black-and-white imagery. This discrepancy, and the lack of a near-infrared spectrometer on Voyager 2, means that it is really hard to interpret what the colors on Triton really mean. However, Triton has a huge diversity of terrains on its surface, showing many active geological processes. On its closest approach to Triton on August 25, 1989, Voyager snapped several high-resolution mosaics. Triton is considered to be a Kuiper belt object that was captured into Neptune orbit, an event that would have heated it and altered its surface through cryovolcanism. As a result, there are few large craters; a few small ones are visible in this mosaic. There are cryovolcanic paterae which look like volcanic calderas on Earth, and pit chains that look just like Kilauea in Hawaii. It isn't entirely clear if the volcanoes are primarily effusive (slow-flowing lava, where Triton lava is a mixture of water ice and ammonia) or explosive, but the there are examples of both. 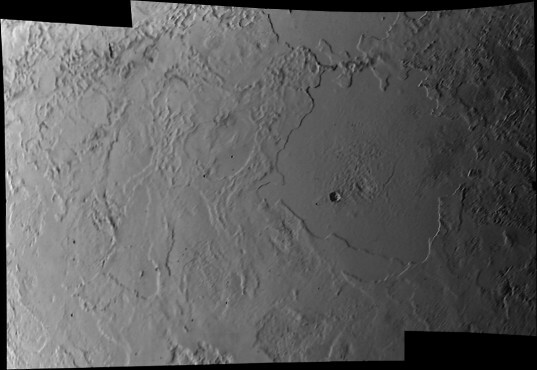 There are only a few tectonic features (ridges and graben) on Triton, and most are associated with larger volcanic provinces. One of the most eye-catching features of Triton is the “cantaloupe terrain” around the equator, so called because it looks like the rind of a cantaloupe. Schenk was the first to explain this as a form of diaparism, caused by the upwelling of a low-density material beneath a higher-density surface. The cantaloupe terrain is very similar to the salt domes of Iran and in the Gulf of Mexico near Louisiana, as well as the the lenticulae on Europa. Voyager 2's highest resolution view of Triton, taken during its Neptune flyby in 1989. New Horizons' best images of Pluto will be about four times more detailed. One point that Schenk wanted to emphasize was that Triton does not have Mars-like polar caps, though there are clearly different terrains at different latitudes. 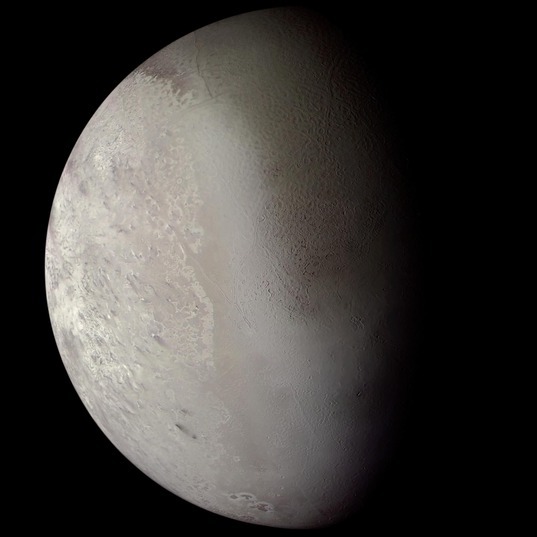 The southern hemisphere of Triton (which was the only one illuminated during the encounter) has three different terrains. There are macular terrains which look like they have been eroded by the sublimation of volatiles (like nitrogen ice), ridged plains, and smooth bright plains. There are only a very few craters on Triton, and it is hard to say if they are relaxed, because Voyager had no way to measure their depth. This is one of the motivations for why New Horizons will take stereo images along a strip of Pluto, allowing us to create a digital elevation model. And as a caveat at the end, there was some discussion about the fact that Triton has water-ice in its spectra, while Pluto does not. So, Pluto's surface must have more other material (nitrogen ice, methane ice, and/or dark organic dirt) than Triton in order to cover up the water ice. Finally, Heather Elliot from Southwest Research Institute gave an update on the SWAP (Solar Wind at Pluto) instrument on New Horizons. While the spacecraft has been cruising to Pluto, it has been mostly hibernating, waiting for the encounter. However, the SWAP instrument was left on, and has been measuring the solar wind at greater than 30 AU from Sun, simultaneously to the STEREO spacecraft are measuring it in the inner solar system. She showed that solar wind speed was similar to the inner solar system, but smoothed out. This was as expected, but it takes a spacecraft like New Horizons to actually prove it. Involving the public is an important goal of the New Horizons mission. We have two big public events coming up this summer in Washington, DC. The first will be the Year of Pluto event on July 16 (one year out from Pluto) at the downtown National Air and Space Museum. There will be public talks by many of the main people in the mission, as well as author Dava Sobel. If you are in the DC area, it will be a great event to come and learn about what to expect next year. The other event will be August 25 at NASA Headquarters. On that day, New Horizons will cross the orbit of Neptune, exactly 25 years after Voyager 2's encounter with Neptune. There will be a cerimonial handing of the torch from the Voyager Principle Investigator, Ed Stone, to the New Horizons PI, Alan Stern. In addition, there will be a panel of the Voyager 2 Neptune veterans that are now on New Horizons, comparing and contrasting the two encounters. Thanks for the great update! That NASA HQ handover event from Ed Stone to Alan Stern will be a very memorable moment for NASA's history file. A rectangular cake with a light blue frosting and a diagonal line with a line frosting drawing outline of each spacecraft (one per side) would look nice and to celebrate with!